The visiting Cumbres Dif club from Chetumal, Mexico, brought U-17 and U-23 teams, under coach Eduardo Cabrera, to play against HUYSC U-17 and the Hattieville Monarchs squad, respectively. 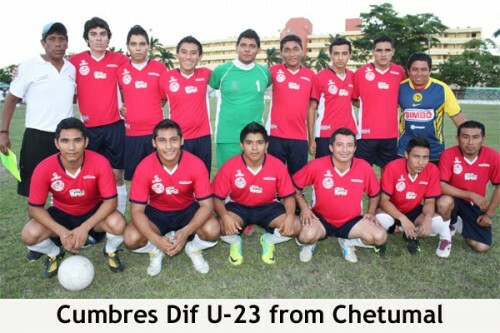 According to a member of their coaching staff, the Dif U-17 is the 3rd Division amateur champs of Chetumal; and the other team is a U-23 amateur selection from Chetumal. It was a similar outcome in the U-23 game, although Club Dif took a 1-nil lead into half-time. The visitors showed some good passes, but the speed and individual talent of Hattieville Monarchs eventually prevailed, and it ended 3-1 in favor of the Monarchs, with Faisal Ahmad netting twice and Ralph Spain once for the winners.